This is the second piece from my painting marathon the other day. It's a pretty, small side table. It had a nice warm, well worn patina to it, but it did have several water rings on it. I used a bit of my Rub N Buff Antique Gold to highlight a couple of the rings around the base. However, by the time I had painted, distressed, and waxed this piece, it had pretty much disappeared. I guess next time I want a bit of gold peeking through, I need to use paint! 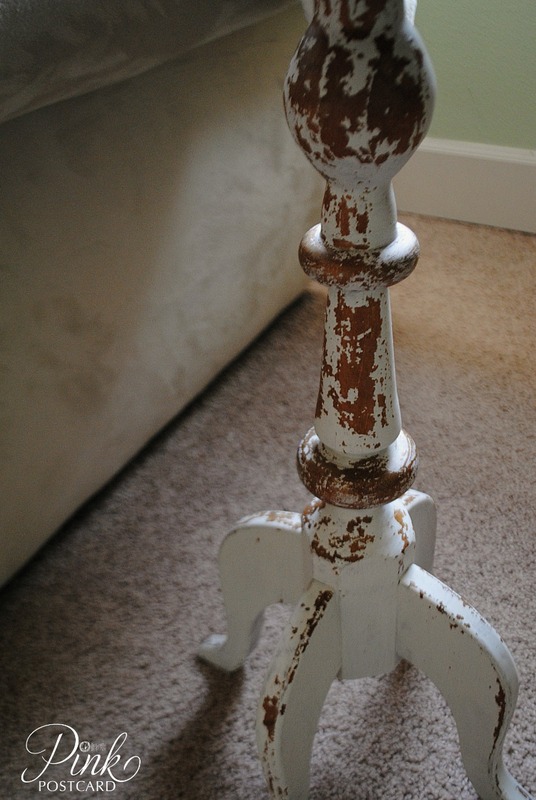 This piece was also done in the MMS Milk Paint, again in the Ironstone. I wanted a really chippy look to this one too. 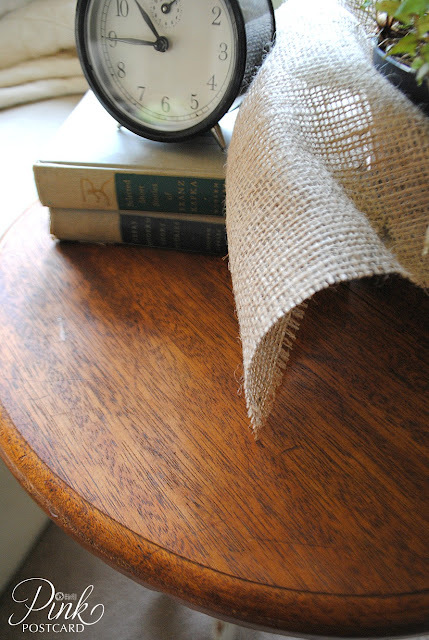 and was inspired by a little table in the book. The top was gently sanded with a sanding sponge. It didn't take much to smooth out the water rings and patina. I used one of my favorite products that I have featured here before - Old English. It restored the top beautifully without having to stain it and wait for the sticky finish to dry. As I was re-doing the top, I realized that Miss Mustard Seed has also talked about Hemp Oil doing the same thing. I need to give that a try to compare to my usual method here. It's a cute little piece, and it's also now in my space at Aunt Bee's House. I'm enjoying my self imposed stay at home day today, thanks to my car being in the shop getting some much needed fixes. Lots to get done around here! I LOVE IT!! Love how you left the top stained too! She sure is one cutie!!! 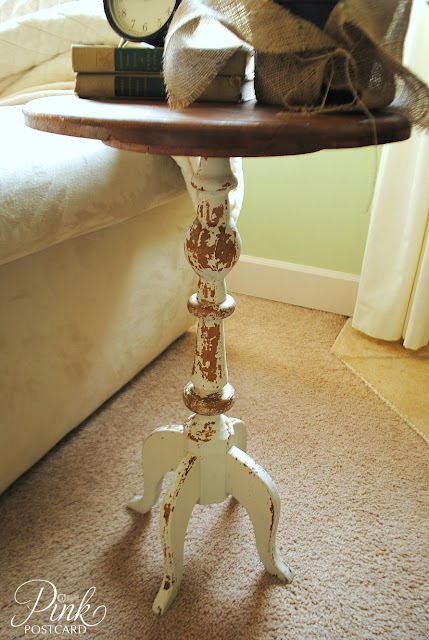 Really like this--the finish is great--the milk paint worked really well on this. 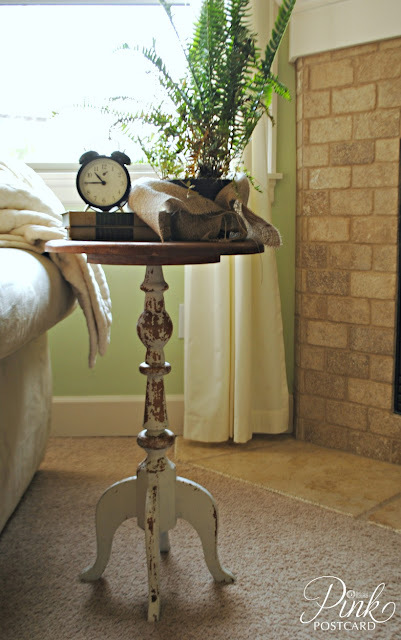 Adorable table, the top looks great with the rest painted.